Usually Dan gets up before I do and tries to keep the zoo ruckus to a minimum while I catch a few extra minutes of sleep (partly because I'm still getting up to nurse Matty in the middle of the night, but mostly because he's a saint). But Dan is currently out of town, so last night I gave myself a motivational pep talk ("You have to get up early. You have to because...something about being a good parent or something, I don't know. Stop asking questions, YOU JUST HAVE TO DO IT") and went to bed expecting very little sleep. I woke up this morning how I wake up most mornings. Ella and Mabel talking to each other in "hushed" tones (.2 decimals quieter than their normal voices) and the sounds of their feet pounding around in the den and kitchen area. I was just about to drag myself out of bed to go throw some Cherrios at them when this happened. GUYS, MY BABIES MADE ME BREAKFAST IN BED. 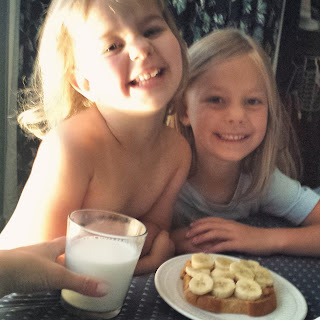 Peanut butter and banana toast and a glass of milk. I wish I could say they came up with the menu themselves since this is obviously the breakfast of a 7 year old, but alas this is what I eat every single day on my own accord. Ella also got her and Mabel's cereal ready and, because Ella is definitely my daughter, we were all treated to a "dessert" of mashed berries and brown sugar (? Not quite sure, but it was called dessert so I ate it). It was magical. Breakfast in bed and the realization that my oldest daughter can now prepare breakfast for herself and her sister: setting the gold standard for waking up early since 7 am this morning.